These Oatmeal Butterscotch Cookies are flavorful, soft, and chewy. They’re great cookies for the Fall season and incredibly easy to make. These cookies are soft and chewy so it’s best to roll these into smaller balls before baking. If you make the cookies too large they will crumble and fall apart while they are cooling. After the cookies have cooled on the baking sheet for about 10 minutes, transfer them to cooling racks to cool completely. Butterscotch is made from brown sugar and butter so the flavor pairs nicely with milk or hot cocoa. These Oatmeal Butterscotch Cookies are great to make for cooler Fall days and great to share at Fall family gatherings. 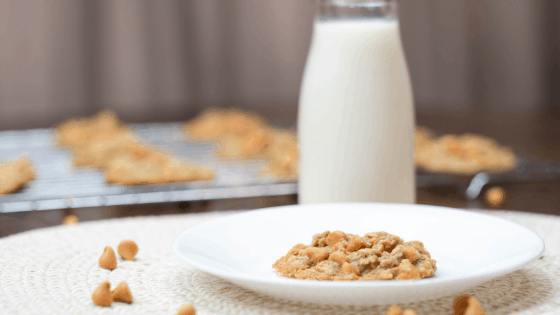 This oatmeal butterscotch cookies recipe is a great addition to the fall season. They're flavorful and the texture is amazing to bite into. They also make a rather large batch so they're great to make for a crowd. In electric mixer beat butter, sugar, and brown sugar until smooth and creamy. Add in 1 egg at a time and mix well. Add in vanilla and blend. Add in baking soda and flour a little at at time, making sure it blends well. Mix in the 3 cups of oats until mixed well. Either use a cookie scoop or drop by rounded teaspoon onto cookie sheet. Bake for 7-8 minutes and let cool completely. Ohh my goodness! These look amazing! Skimming the recipe, starting with butter convinced me to give these a shot. I have never used butterscotch morsels in oatmeal cookies, but that sounds wonderful. I will be saving this recipe to try for sure! These look and sound delicious! Perfect for the Fall season! I will have to try making these sometime. These look so delicious and perfect for fall, I will have to try them! Omg. I LOVE oatmeal cookies, but oatmeal butterscotch! You’re trying to kill me with deliciousness. This looks so good. Definitely gonna have to make me some bomb cookies. Thank you ? Oh these look so delicious! I love butterscotch! They look great for thanksgiving or Christmas! These look and sound so delicious! Perfect for fall too! This recipe reminds me of my childhood. My mom would make these cookies and we would eat them when they were warm. They’d be a little crispy and we’d get a glass of milk. Good memories.